James realised he was nervous, which seemed amusing in its way. There’d been no actual dates with Leanne at the rock choir – just kisses in her car, or his, after a quick drink when rehearsal ended. Fumblings. And some talk too, the first two Tuesday evenings, because Leanne was so sad about Rob, so patiently sympathetic it made her tender. Not enough to end a healthy marriage, but when it came to relationships, health could be a subjective thing, no tests available. He imagined it would be different with Tanya, although what it would turn out to be was very much an open question. Maybe just a coffee and debrief after they’d been around the exhibition? 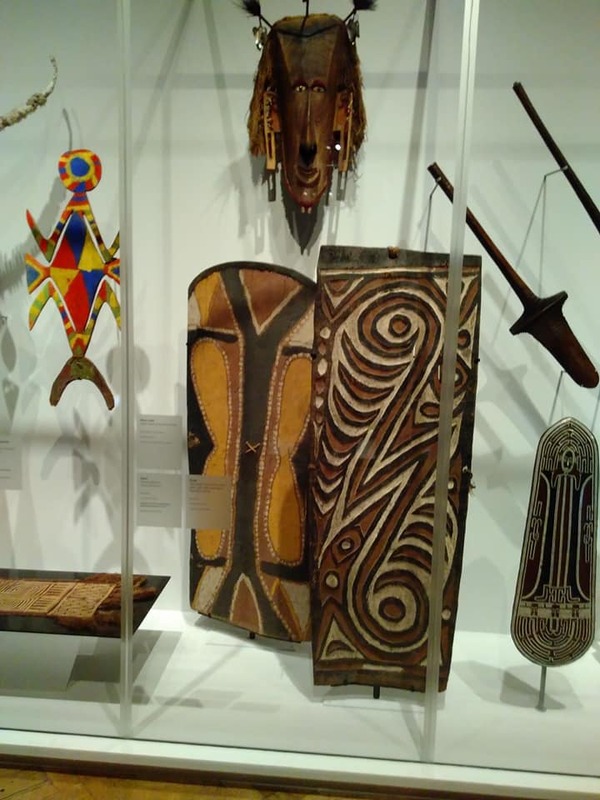 Oceania at the RA was her choice but he’d been enthusiastic; he liked not really knowing what it would offer – although he’d like to know what she’d understood from his briefest of emails, because he’d hardly been open about his hopes and yes, a good few dreams. Remembering Manda’s news that she’d ended her own relationship, almost before his source informed him it was happening, he couldn’t be sure how Libby would react if he began something with Tanya. Manda had a theory that their daughter’s development towards maturity had been stunted by grief and she was stuck at a flammable nineteen. But as far as James could see, everyone was still a kid at twenty-two; it was just that no one admitted it until they were heading for fifty. Manda’s family lunch had been about as relaxing as a cross-country run through sleet at boarding school. “I always had time for you, love.” Manda passed her the salad. It would have been funny, given Libby’s reluctance to talk about anything much at all, except the on-off feud with Bee that – like Brexit – he’d stopped trying to follow. Clearly she hated it when they agreed about something for her supposed benefit. Libby had perfect theatrical timing in these situations. Manda seemed to think progress had been made by the time they’d finished what was a surprisingly splendid vegan meal, but he couldn’t really see how or where. They were a family made to be four, not three. Rob had changed the dynamics; it was a fact. He was the superglue son, binding the three of them together for all their tugging. In fact, James understood the climate activists were using superglue now, in this rebellion Manda had embraced. Doubtless she’d stick herself somewhere soon; it made his skin creep to imagine it. He was meant to be meeting Tanya outside which wasn’t the best idea given the recent drop in temperature. Reliving his astonishment when she called him back after he left a message with Nick, he wondered what colour her hair was now, what she’d be wearing. And expecting. He didn’t even know her age. It was foolish to be so early, he thought as he arrived in the courtyard and saw what seemed to be the house from Psycho parked there in a Tate Modern sort of way. He’d better not make any derogatory remarks about modern art to Tanya or he’d be showing more than his age. His conservatism, as Manda put it. “You’re part of the Establishment, James, and it’s not done humanity much good.” Since he didn’t ask his parents to send him to private school, or ask for the salary he commanded, it didn’t seem entirely fair – especially as these days he suspected his partners considered him something of a snowflake. He ran a comb through his hair, aware that it was still good and that Libby was glad she’d inherited it, given the wild alternative Manda passed on to Rob. Tanya was behind him, and her own hair was vivid blue. Her tights were purple and her coat a kind of patterned artwork in itself. Her shiny Doc Martens looked too big for someone her height. The exuberance of it all made him smile. But headphones, he thought, would exclude the person he wanted to know, and block the space between them. They walked inside to join the queue. Manda was surprised, during her late lunchbreak, to see a message from Nick Gorski asking her to call him. She expressed curiosity and asked what she could do for him. “I should be pickier myself, about who I sleep with.” She knew she sounded calmer than she felt. There was something ridiculous about it, about her. It was a truth she could have understood if she’d been woke as the kids of America seemed to say now. And it wasn’t a death. “I should know better at my age. And stupidly, part of me did.” She thanked Nick and said she must get back to work. Surprised, she told him it wouldn’t, and yes, she knew. So Nick was back on track and that, at least, was something to celebrate. Now, though, she needed a shower. She must wash her hair. But she couldn’t clean inside, where he’d been, where she’d let him into her world, her beliefs, her grief, and he’d ransacked it all for what he could sell. James had had no idea. Ten thousand islands on the map around the wall! Impatient to explore the artworks he could see ahead in the next room, James would happily have skipped the poem delivered on film by an earnest young woman from the Marshall Islands who was labelled a climate change activist. I lived with one of those, he could have told Tanya with a smile that was wry and worn. He looked back to the cascading textile tsunami that fell to the floor and dominated the octagonal hall, and supposed that it wasn’t simply beautiful, but a warning. Was that the message here – not art but politics? Tanya seemed rapt. He might as well not be there. As the film finished ready to begin again, she sighed. “I’m more worried about the future than the past,” Tanya said. James had read that the two hundred works, small and huge, illustrated five hundred years of history. “But what a past!” he cried. There was a soul canoe presumably rowing to the afterlife, and many paddles that looked too heavy to lift. 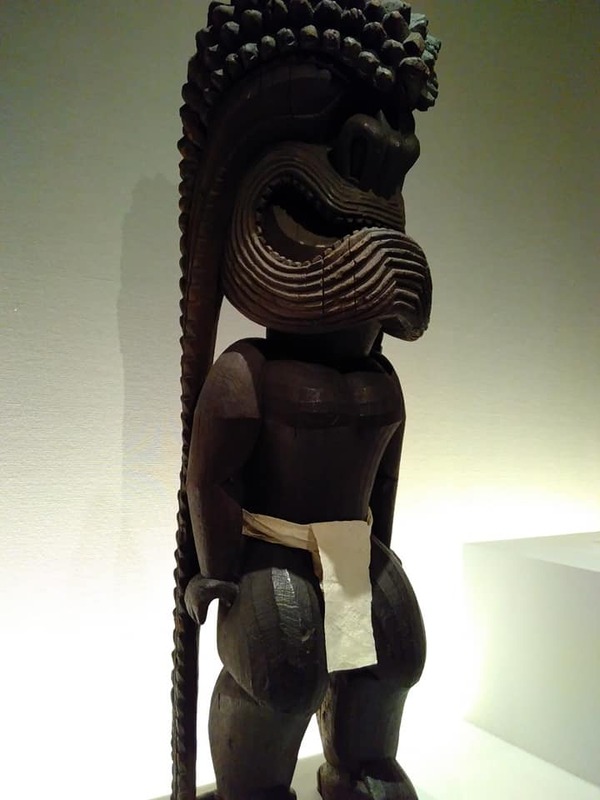 A Tahitian mourner’s costume that looked too heavy to wear. Something seven metres long that reminded him of his university rowing days but turned out to be a ceremonial feast bowl from the Solomon Islands. Some of the ornaments were made of shell, some greenstone and some ceramics. Tanya seemed fascinated, studying the captions and moving slowly and rather independently. He felt surplus to requirements. “Am I the only person here who knew nothing about all this?” he asked her as she looked at him and smiled, as if remembering his existence. James looked at her afresh and in spite of the colours he thought he could see something he might have called exotic. “Ah,” he said. “I understand. It’s personal.” With women it seemed things always were. They moved into the next room, where some of the god images were tall and pretty ferocious. “I like this one,” said Tanya. James wasn’t sure he could buy into the paradise defiled narrative. Life wasn’t usually as black and white as that, and these people weren’t all love and peace. No one was, in spite of Manda’s dreams. They came to some drawings by a Tahitian priest who joined the Endeavour and Tanya said she hoped Cook and crew gave him celebrity treatment. Since he hadn’t, James feared he was disappointing her at every turn, but he hadn’t expected her to be a royalist. Shouldn’t that be him? Although this was hard to dispute, she did seem to be putting a negative spin on a stunning exhibition. At that she stood, with more speed and ease than he could manage. Had he said the wrong thing? He could say he’d like to be friends while privately blaming Nick Gorski for passing her contact details over without as much as a hint. He could pretend he’d only wanted her to film something for the practice, and then say the other partners overruled. And he would very much like to advise everyone around them who had presumably heard her less-than-muted speech to focus on Captain Cook. Chapter 11 will be posted on Friday 29th March at 5:30 UK time. Love this chapter, Sue! So many pertinent layers weaving beneath the storyline! I love the way you write about your characters and their lives and loves – especially when they have had disappointments or even betrayals. You are so sympathetic and loving towards them. Their development week by week in this serialised novel is enthralling.